Robert Gordis (1908 – 1992) was an American leading Conservative rabbi. He founded the first Conservative Jewish day school, served as President of the Rabbinical Assembly and the Synagogue Council of America, and was a professor at Jewish Theological Seminary of America from 1940 to 1992. He wrote one of the first pamphlets explaining Conservative ideology in 1946, and in 1988 he chaired the Commission on the Philosophy of Conservative Judaism which produced the official statement of Conservative ideology "Emet Ve-Emunah". 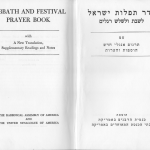 Gordis was the founding editor in 1951 of the quarterly journal Judaism.